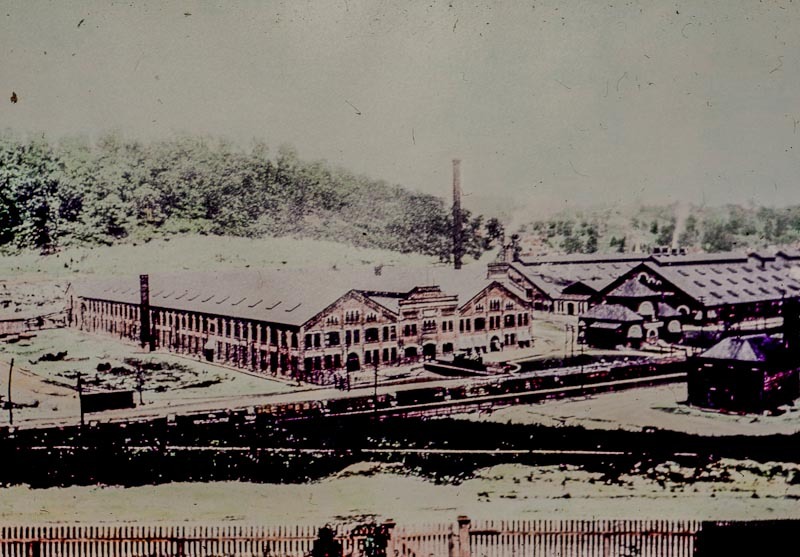 In 1862, Thomas Clunes opened a small engineering works and foundry opened at the Vulcan Works in Worcester (pictured left). In this same year McKenzie and Walter Holland, employed by the Oxford, Worcester and Wolverhampton Railway, purchased a locking frame patent, number 31 of 1860, from the patentee, Austin Chambers. McKenzie, Clunes and Holland, formed a partnership in 1862 to manufacture this locking frame and used the Clunes Works for the purpose. McKenzie, Clunes & Holland took out a patent, number 1,963 of 1866, for interlocking between levers, there being a separate lever for each point and each signal. This was ten years after John Saxby had secured his famous patent for ‘a mode of working simultaneously the points and signals of railways at junctions to prevent accidents’. In 1869, Saxby & Farmer sued McKenzie, Clunes & Holland for infringement of their patent rights. The issue reached the House of Lords, which decided in favour of the Worcester partnership. Peace was established between the rivals in 1901, by which time M&H, Saxby & Farmer, Evans O’Donnell of Chippenham and Dutton of Worcester were joined together in what was to be known as the Consolidated Signal Company. In 1894 it took over the patents relating to the electro-pneumatic signalling system which were owned by the Westinghouse Brake Company and, in 1907, completed arrangements, in conjunction with the Westinghouse Brake Company and the Consolidated Signal Company, to produce and sell automatic and power signalling apparatus through a new company called McKenzie, Holland & Westinghouse Power Signal Company, Limited. These Brake and Signal interests were amalgamated in 1920 and operated by Westinghouse Brake & Saxby Signal Company, Ltd. The Vulcan Works at Worcester were closed and the business, and much of the machinery and plant, were transferred to Chippenham. The McKenzie & Holland name remained alive and well though, especially in Australia where the Company had been active since around 1884. With offices in Melbourne and Brisbane, the Company continued operation well into the 1970s, when the Westinghouse name was gradually adopted. According to Ossie Nock, the McKenzie & Holland records were destroyed during an air raid which hit the South Block of the then Head Office in York Way, Kings Cross, London. Nick Smith has now finished his cataloguing of the McKenzie & Holland drawing scans within the Siemens / Invensys / Westinghouse archive. This can be found here. If you find a drawing you need access to, use our ‘Contact Us’ form for further information. Don’t forget there is a similar (but much larger!) drawing index for the Sykes company on our Sykes webpage.